Content on all other George Washington sports whose contests are not broadcasted on WRGW Sports. He smiles as if I had just made a joke, though looks understandingly as if he’s heard it before in a humorous fashion. I asked him what it is like to be a student athlete, but his reaction was apparent that term takes on different contexts relative to the sport in question. Zach Lehan, a sophomore, is one of 33 sailors on George Washington’s coed sailing team, the highest ranked athletics program at GW in their respective sport. However, while the non-revenue generating team is the most accomplished on campus, Lehan says it is hard to draw the same crowds the Smith Center sees during basketball season. “It’s a 15 minute drive away from campus to get to the marina, and regattas are usually long and can last over six hours,” Lehan says, articulating the long days and distance from campus is a main deterrent to the team seeing large crowds. The team practices four days a week, and acts as a two season sport, as regattas are year round events that call for training year round. Lehan and his teammates practice Tuesdays and Thursdays at 7:30 in the morning after a team breakfast before heading to Washington Sailing Marina. When the team travels to regattas out of state, they aren’t in buses like the basketball team nor take flights. Lehan and the other 32 sailors travel by van, though the packed vehicles provide for bonding time, a key part to the team’s wide success and chemistry. Lehan describes sailing as one of the most team oriented sports, emphasizing the importance of sailors working together over their individual roles. He is part of a crew, and synchronization with each other is paramount. Many of the crews have been sailing together since freshman year until graduation, fortifying their relationships and chemistry over four years that has cultivated their widespread achievements. The sailors quickly learn any success enjoyed by the program is synonymous with the team building and bonding away from the water. “We are definitely a tight knit group, more like a family,” Lehan gushes describing the close community he and his teammates are a part of. Maybe we’ll see Zach on the Smith Center window one day. If not, you can see him at the marina and get a free hot dog while you’re there. 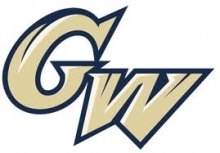 The George Washington Softball Team (3-6) went 1-3 this past week at the UNC-Greensboro Invitational, defeating host UNC-Greensboro 10-1 after dropping the first three games of the weekend. The Colonials struggled in the first three games only putting up 7 total runs before erupting for 10 runs in the final game of the weekend. In the opener, GW would fall to Longwood 4-3 despite a solid effort on the mound from Junior RHP Sarah Costlow (1-2). Costlow would pitch all 6 innings, giving up 4 runs (2 earned) on just 5 hits and 2 walks. GW would get on the board in the top of the second after a home run from Freshman Utility Player Jenna Cone. However, Longwood would respond with two runs in the bottom of the innings giving them a lead they would not relinquish the rest of the game. Just a few hours later, GW fell to host UNC-Greensboro 6-2 after Freshman southpaw Kaitlin Buff (1-2) struggled to get through the 5th inning. Buff had a no-hitter going into the 5th but she would give up 6 runs (5 earned) on just 3 hits, 4 walks, and an error. Faith Weber finished the final 1 1/3 innings in relief of Buff and did not give up a run. GW scored both of their runs in the first innings when they started the game off with back to back singles from Alana Anderson and Megan Linn and both would score giving GW a 2-0 lead. UNC-Greensboro scored 6 runs in the 5 inning to give them the lead and the eventual win. The rematch with Longwood Sunday afternoon did not go well for the Colonials, as they fell to the Lancers 11-2. The two teams put up zeroes in the first four innings before Longwood scored 6 unearned runs in the fifth inning. Sophomore RHP Jayme Cone (0-1) was coasting through the first 4 2/3 innings before giving up 2 baserunners and then the costly error would give Longwood the lead for good. Ashley Pitcher (Very Appropriate Last Name BTW) would come on in relief to get the last out of the 5th and then proceeded to give up 5 runs (4 earned) in the 6th. Offensively, it was another quiet game for GW as they totaled just 4 hits on the afternoon. Faith Weber hit a 2 run pinch hit Home Run in the fifth inning, her first hit and home run as a Colonial, but that wasn’t for the Colonials to rally. The Colonials would finally get a W in Greensboro after they defeated host UNC-Greensboro 10-1 in their final game of the weekend. Costlow (2-2) was wild but effective for the Colonials in her second start of the weekend going all 5 innings, giving up just 1 run on 3 hits, 3 walks, and 2 HBP. GW got off to a quick 1 run lead in the top of the first after Senior Megan Linn walked and then scored on a double from Paige Kovalsky. After UNC-Greensboro tied it up in the first, GW responded with 6 runs in the second behind Jenna Cone’s Grand Slam (second homer of the weekend), which gave GW a commanding 7-1 lead that they would not give up. Overall, the MVP of the weekend offensively for GW has to go to Freshman Jenna Cone for hitting two home runs. She has been the power threat for the Colonials thus far, with 3 home runs, 10 RBI’s, as well as leading the team with a .667 slugging percentage. The pitching MVP definitely goes to Sarah Costlow for her two starts where she went 11 innings and gave up just 3 earned runs. Costlow leads GW in essentially every pitching category. Next up for the Colonials will be the home opener this upcoming weekend in the GW Colonial Classic. There will be 6 GW games starting this Friday at 1 pm vs Quinnipiac. There will be double-headers Friday through Sunday so look out for a bunch of GW softball this weekend. WRGW Live Coverage of GW Softball will begin this weekend for the opener vs Quinnipiac and will continue throughout the weekend. The GW Softball team (2-3) opened up the 2017 season with wins vs Bethune Cookman and Delaware while falling to Providence, LIU Brooklyn, and Stetson in the D9 Orange Blossom Invitational. For first year Head Coach, James DeFeo, the win vs Bethune Cookman was his first at GW. The Colonials were led by Senior Third Basemen, Paige Kovalsky, who hit .400 while scoring 5 runs and stealing 2 bases. After hitting just .268 (and struggling on the mound with a 5.30 ERA), Kovalsky getting off to a hot start is just what the Colonials needed. Also having a strong opening weekend was Junior Outfielder Alana Anderson, leading GW with 7 base hits across 5 games. GW struggled on the mound throughout the weekend, giving up 26 runs in the three losses, while giving up just 5 runs in the two wins. Junior Sarah Costlow, who was flat out dominant for the Colonials the past two seasons, really struggled in her initial appearance this weekend but then was on fire in her second appearance. Costlow would give up 9 runs (8 earned) in the opening game vs Providence but would rebound with 5 strong innings in relief of Jayme Cone against Bethune Cookman. Freshman Southpaw Kaitlin Buff also pitched the first complete game of her career when the Freshman pitched 7 innings against Delaware Saturday afternoon, despite giving up 4 earned runs. Up next for the Colonials is a trip down to Greensboro, North Carolina where GW will play in the UNC-Greensboro Invitational. GW will face both UNC-Greensboro and Longwood twice. The Longwood games will take place Saturday/Sunday morning at 11 AM while the UNC-Greensboro games will take place at 1:30 PM. Longwood will enter the contest at 2-7 while UNC Greensboro sits at 5-4.